Among the new wave of young talent from Northern Mali. LEILA GOBI began her career as a student and grew to national attention. As an artist from provincial Menaka near Gao Mali, it was tough to break into the tightly knit music community in the capitol city, Bamako. But Leila’s talent quickly brought her recognition and she has became a sought after backup vocalist for many great musicians in Mali. By 2010 she had formed her first group and performed in her own name to cheers. 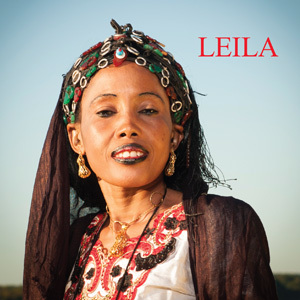 In addition to having performed extensively in Mali, Leila has toured the sub-Saharan region performing in Niger, Burkina Faso, Ivory Coast, Guinea, and Senegal. In September 2013 she performed in North America as one of the musicians presented by Clermont Music in its Festival au Desert /Caravan for Peace tour. She performed in Lyon France and Geneva Switzerland in 2018. Her first internationally released album, LEILA, was released on 18 April 2015 and sold out. In 2017 she released her second album which fused electronic instrumentation with traditional for a new sound. She is continuing to evolve that sound working with Malian and French collaborators.